Fort Cobb is a bit of a misnomer. Unlike some towns, like Fort Sill, that actually grew out of ‘old west’ military installations, the town of Fort Cobb is three miles NW of the site of the actual military fort, which was located at the fork of the Washita River and Pond Creek. Pond Creek was later renamed Cobb Creek to fit with the fort’s name. The fort was created in 1859 by the Superintendent of Indian Affairs to establish the Washita Agency. The fort that would house the Washita Agency was named after the Secretary of the Treasury, Howell Cobb. Four companies of cavalry would be assigned there under the command of Maj. William H. Emory to protect the local Washita Indians from attacks by the Comanche, Kiowa, and Cheyenne tribes that had in turn also been relocated there from their natural homes. With the coming of the Civil War, Emory feared his command would be cut off if Texas and Arkansas seceded, so he relocated his forces to Fort Leavenworth, Kansas. 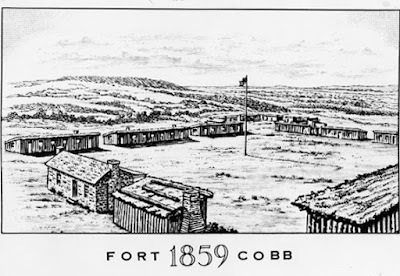 Texas Confederates quickly seized the fort, but they soon left, and Fort Cobb was left abandoned for most of the war. U.S. forces returned to Fort Cobb in 1868 to find only the walls of a stone building remaining, and a few broken pieces of adobe structures. The latter were thatched over for storage buildings, but most of the soldiers lived in dugouts in the ground covered with tents. Forces under Gen. Philip H. Sheridan arrived the following winter as part of his campaign to force the remaining hostile tribes onto reservations. Fort Sill was established only 50 miles away early in 1869, so on March 12, 1869, Fort Cobb was abandoned for good. The only thing remaining to mark its existence today are a few trenches. 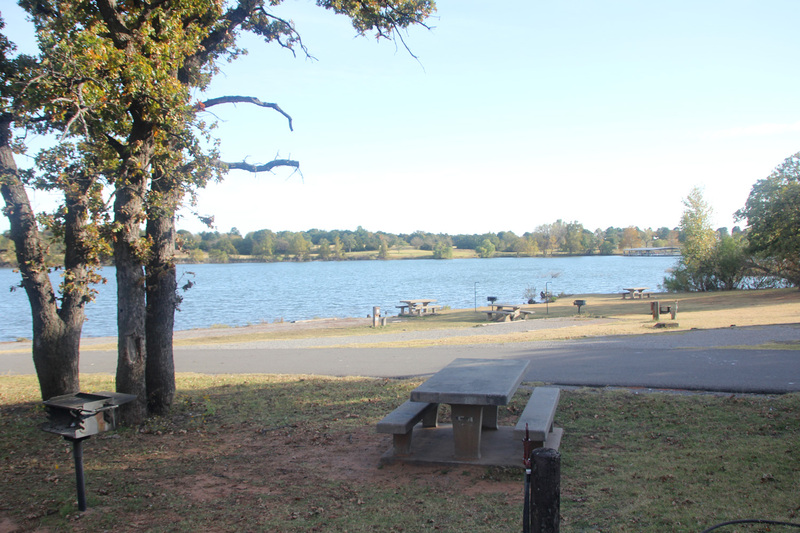 While the town of Fort Cobb was northwest of the original fort, Fort Cobb State Park was created in 1959 with the damming of Cobb Creek 4.6 miles north of the town. (L35.1745N Lo98.4402W, P. 79 of the Oklahoma Water Resource Board book, “Lakes of Oklahoma.”) Our 110 mile drive down to Fort Cobb State Park took three hours. Part of the extra time was due to missing a turn. We were going west from Binger when we came into a long construction zone. I had been concentrating on meeting traffic with the RV on the narrow temporary lanes. I finally decided we had gone too far for our turn onto Rt. 146 South, so we needed to turn around. For the most part, shoulders have yet to be invented in Oklahoma, nor were there any good, safe turnaround locations. We had to turn onto a dirt side road, but that left us backing across the main road through a blind intersection to turn the rig around. I asked Jean to go back and signal when it was clear for me to back across the highway. As I backed across, she walked across by the rear of the trailer to come upon a skunk in the tall grass, which left her trapped between the skunk and the side of the trailer. It was about half-grown and just as startled as Jean was, but as it turned its business end toward her, she ran around the back toward the other side of the trailer, and yet another catastrophe was averted. Trying to figure out where we could have gone wrong, it made sense that the problem would have occurred in the construction zone. Sure enough, when I got back to where I felt the road should be, there was again no sign for the state park, but the route sign stood nicely hidden behind a large piece of construction equipment where even a careful observer wouldn’t have seen it coming from the east. We made the turn and headed south as we followed the DeLorme Atlas ever more carefully. When we reached the road that the atlas indicated should have been the turn for the state park entrance, again there was no sign for the park, and as I looked to the right I was faced with a huge hill like I was looking up an Olympic ski jump. Surely they would not be having RV trailers pulled up that hill, but I noticed traffic approaching from behind us, so I committed and made the turn. That indeed led us into the entrance and the park ranger station. We had never been there before, but found a paved campsite that was absolutely beautiful…level, smooth concrete, with plenty of room, and high enough to drain well. We pulled in, not believing our luck, and got set up. It was 3:30 p.m. Once I was about done, I got out to walk around a bit, and there in front of the longer than normal lane to the campsite, on what would have been the blind side of the truck, was a small brown sign designating the space as reserved for handicapped usage. My dubious luck was obviously holding, so we undid our set-up, moved to another space, and repeated the whole process over again. 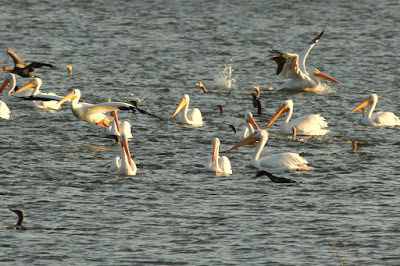 American Pelicans and Cormorants enjoying the evening. A nearly full moon rose to illuminate White’s Catfish Cove. 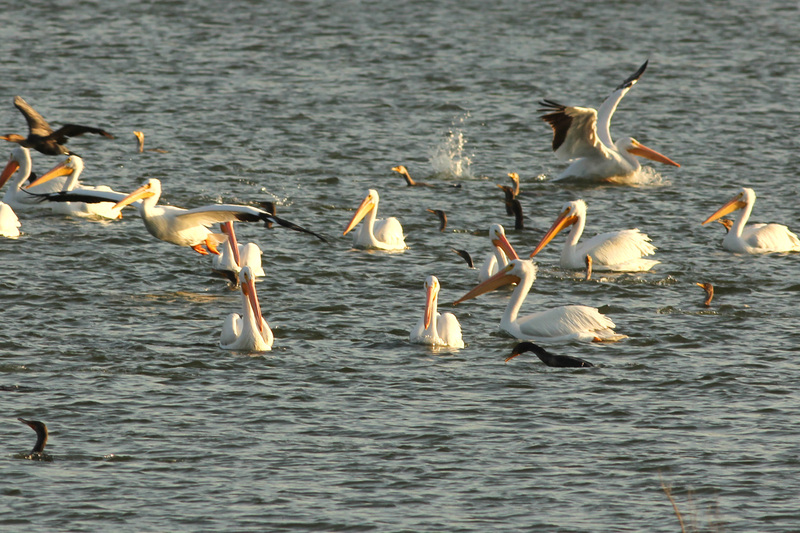 This was the fall’s last hurrah, and all the wildlife were out to enjoy a beautiful evening. In the short while before darkness fell, we saw cormorants, Blue Jays, woodpeckers, flock upon flock of Canada geese, seagulls, a couple hundred or so coots, heron, ducks, an owl, a bull frog, a few pelicans, and two packs of coyotes calling back and forth between themselves. About the only thing we didn’t see in the cool evening were mosquitoes. Finally, a win.